In March 1944, three students disaffected with the Miscellany News coverage, considering it too quick to criticize campus authorities and incite change for the sake of change, chose to found a rival paper on campus. Phyllis Safarik, Mariajane Clarke, and Audrey Talmage, Class of 1945, brought reporters, editors, and administrators together to create The Vassar Chronicle, an alternative to the Misc. that promised to focus primarily on campus events and present national issues factually and broadly, avoiding bias as much as possible. Funding for the paper depended upon subscriptions and advertising, just like the Miscellany, and both papers had the approval of the Student Association. 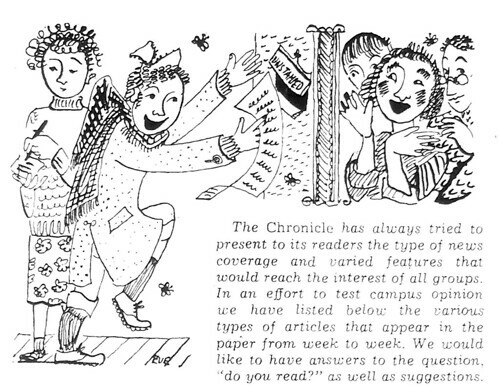 The Chronicle proposed in its first editorial on March 1, 1944, to hold Vassar journalism to a high standard, and in the first few issues it ran a contest awarding a nickel for each error found in the paper. By the mid-fifties, however, the papers had begun to look almost identical in format and content, with similar front pages and editorial stances. Any perceived conservative bias was now gone from the Chronicle’s pages, replaced by the same political leanings reflected in the Misc of the era. The journalistic community at Vassar had become basically homogeneous in its political leanings and beliefs about campus issues. By 1959, the difference between the two papers was simply cosmetic, and the campus began to push for a return to a one-paper campus. The President's CCEP (Coordinating Committee on Educational Policy) recommended a reorganized, consolidated campus newspaper drawn from both the Chronicle and Misc staffs. In the February 7 issue of the Chronicle, its editors requested that the Miscellany News join with the Chronicle in publishing "one longer weekly issue improved in quality." The editorial proposed a combination of the two papers, keeping the staff of each paper, and putting the combined efforts of the two papers into a single publication. The Miscellany News refused to consider any such program. It claimed that the Chronicle wanted the merger because of insufficient funds, and pointed to the differences between the two paper's editorial policies (majority v. unanimous opinion of the editorial staff) as proof of fundamentally different journalistic attitudes. The disagreement over the merger became heated, fought through editorials and letters to the editor in both publications. The Misc. stood firm in its refusal of the merger and its claim of better financial stability, but the campus community continued to press for an end to dual newspapers. The Misc. held historical precedent as the first newspaper on campus, and the pressure for a single publication fell primarily on the Chronicle. On May 16, 1959, after a semester of angry confrontations in the editorial pages of both newspapers, the Chronicle "put aside personal feeling, in the hope that it may be an example for others to do the same kind of thing in the future. No matter what the cost, we shall have one newspaper at Vassar. Therefore, publication of the Vassar Chronicle shall terminate at the end of this term." In its last issue, the Chronicle published a letter from Warden Elizabeth M. Drouilhet which declared that the Chronicle showed a profit in its last fiscal year – putting an end to rumors of financial insecurity. Helen Codere, professor of anthropology, also wrote to the Chronicle, thanking its staff for "the action you have taken, and for the spirit in which you have taken it." The Chronicle staff moved to join the yearbook staff at the close of the year, and the leftover funds from the paper became a scholarship fund "which shall award $150 dollars per year to a student whose academic achievements are coupled with an interest in journalism. In this way, we are sure that our funds will work toward the betterment of Vassar." With that, the Chronicle ended its fifteen years as the second student newspaper, and Vassar students got what they wanted: a one-paper campus.